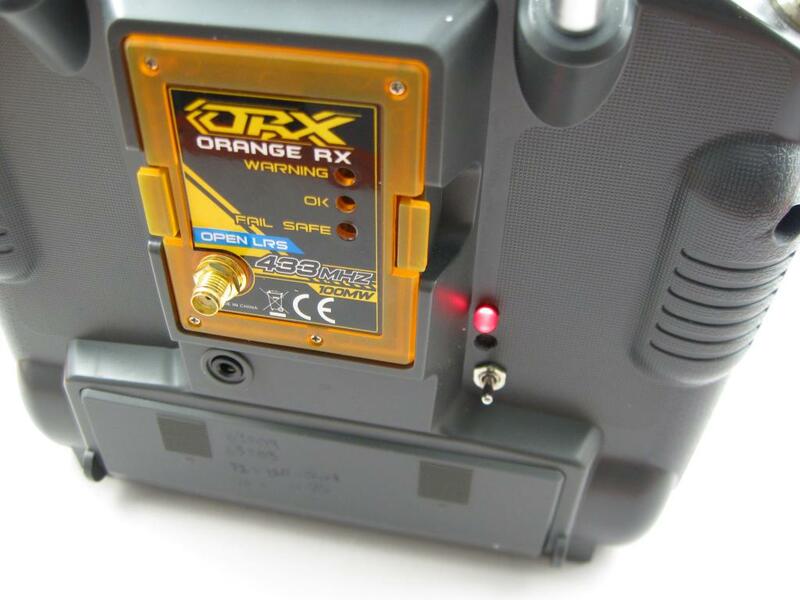 Recently I have been using the Hobbyking Orange 433MHz system with later OpenLRS firmware. I made an improved antenna for the plane but have been using the standard “rubber-duckie” on the transmitter. 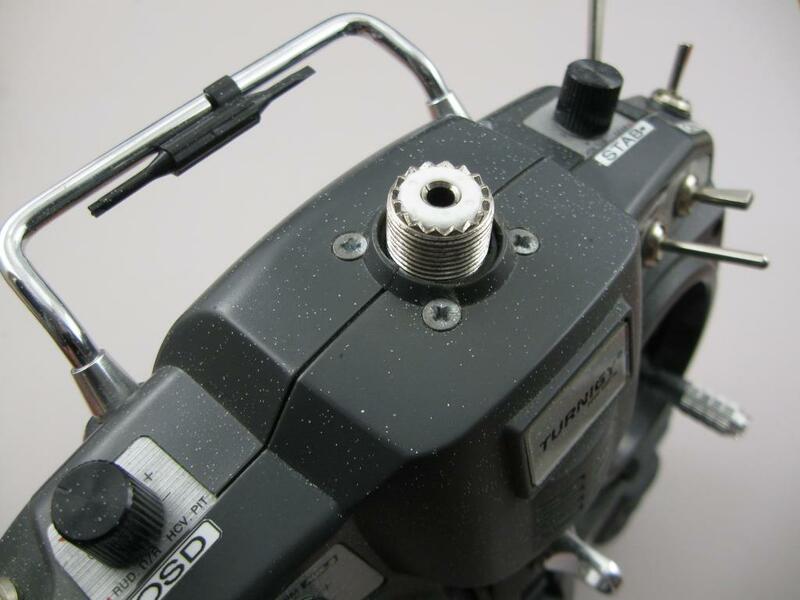 After swapping the transmitter antenna I found that range was only 100-200 meters, and then that there was nothing inside the antenna. I guess the small 50mm spring-rod fell off during production. It didn’t matter and there was little danger as the telemetry-beeper indicated a fault before it became a problem. Having some time ago modified the Turnigy 9X transmitter to include a PL259 antenna socket in place of the original telescopic antenna, I decided to fit the PC Board from the OpenLRS module inside the radio rather than plugging it in the back of the transmitter. 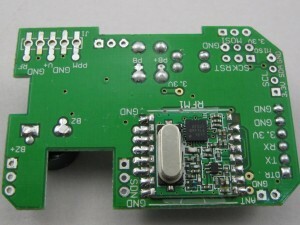 This allows the module to take advantage of the PL259 connector and accept a variety of antennas. Using a OpenLRS receiver as a transmitter was one option, but I decided to strip the module and clean up and install the PCB. This was simpler as the transmitter already had buzzer driver LEDs and a reasonable voltage regulator on-board. 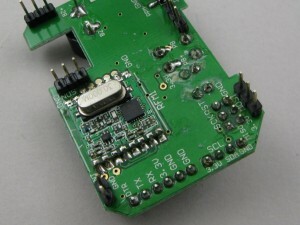 The board needed a good clean up and I found one of the module edge solder joints not soldered. I remounted the module, removed unused pin-headers and cleaned off the flux residue. Without looking at the data I think this is one or the T/R select control lines. There must have been some connection or the default state was OK, because it had been working. The HopeRF module was mounted up on a silicon pad and using large untidy solder blobs to secure and connect it. I replaced the thicker silicon with a thin mylar sheet. The OpenLRS board just fitted nicely into the back of the case on top of the rear board. I used ground pads and component legs (wires) to mount the board. A couple of small pieces of foam prevent shorts where it sits over the end of the antenna coax and protect the crystal. The antenna coax centre core passes through a couple of beads and still attaches to the original board. 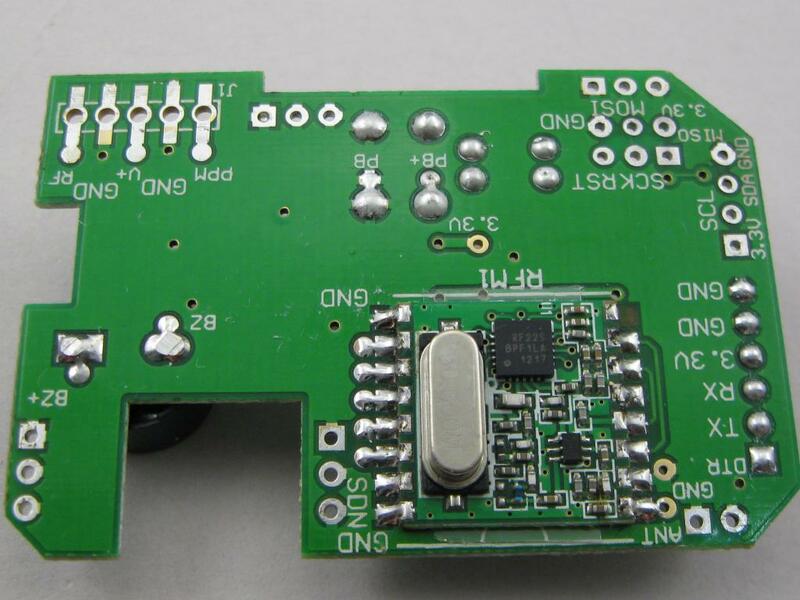 This allows the 35MHz JR module to still be used. 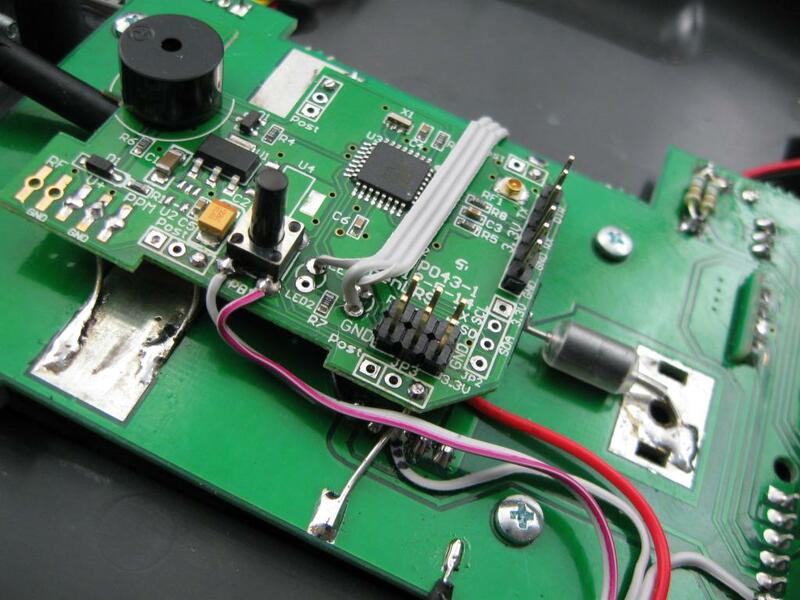 The 433MHz module should withstand the 35MHz signal on its antenna connection without damage. 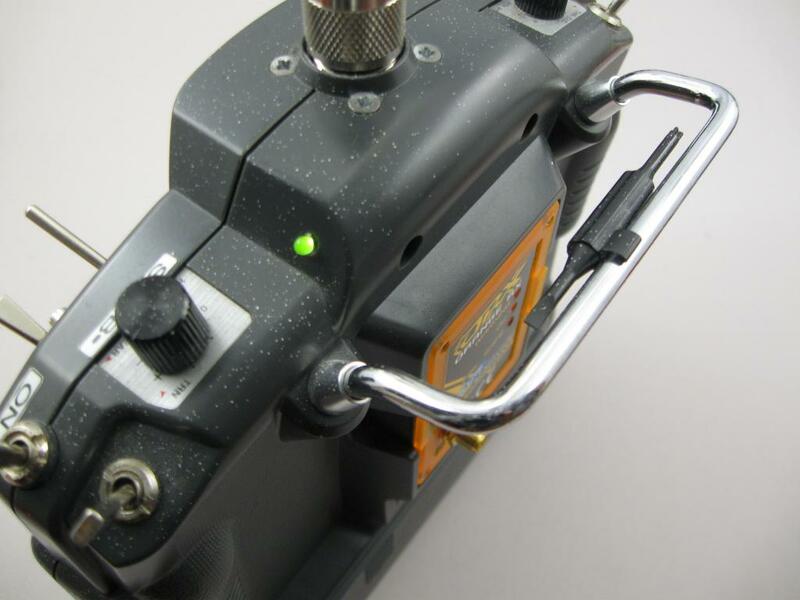 The LEDs and push button are wired to an external dual-colour LED and a recessed mini push button for binding etc. A miniature toggle switch and LED on the back panel switch between the internal 433MHz board and the original JR module socket on the back. I can now use a variety of antennas attached directly to the top of the transmitter or a lead to the antenna on the car or on the tripod. At 433MHz it’s best to keep any coax extensions as short as possible. BTW: The white speckles on the radio are due to over-spray when I was painting something else and left the radio in the garage within range. It adds character. The LED and selector switch. The binding button is recessed down the hole between the LED and switch. The Orange module is now empty and just fills the hole. A adaptor to BNC and hand-held scanner antenna. Probably not the best SWR but I will test it and see how it goes for short range use. 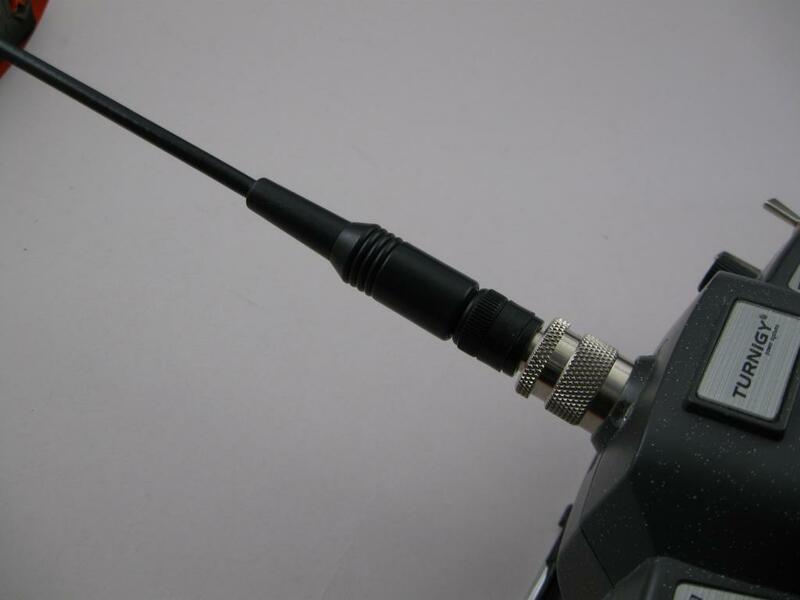 There are various antennas available for 433MHz (the HAM 70cm band) with PL250 and BNC connectors. Some of these require a ground plane, and some not so much. Almost anything will be much better than the little 75mm rubber duckie supplied with the OpenLRS modules. The rubber duckie antennas look exactly like 2.4G wifi antennas but have a single spring-whip of about 50mm length inside. This is the dual-colour (red/green) LED that replaces the red and blue LEDs that were on the OpenLRS module. At the moment I still have to take the back cover off the transmitter to update the firmware. 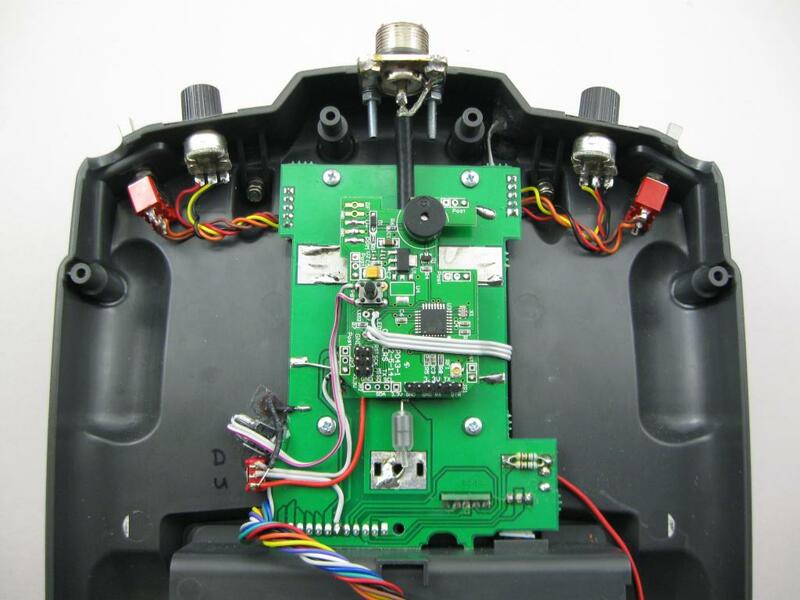 One option would be to add a small selector switch and connect it to the FTDI board that is already installed. Switching the RXD and TXD would be easy. 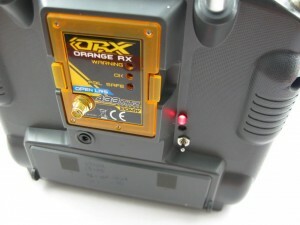 It may also be handy to allow the switching to connect the OpenLRS module and the 9X processor so that telemetry data can be displayed on the LCD. Maybe later on.